Footwear is a major category for general sports retailers as 43% of the respondents in a recent Sports Trader online survey say that footwear contributes more than half to their sales. Equipment is very important for about a fifth of the respondents, contributing more than 75% of their sales — but more than a third reported that less than 10% of their sales consist of equipment. Sports Trader recently conducted an online survey, wherein we asked sport retailers to tell us which product categories are the biggest contributors to sales. In the survey we asked retailers to indicate what percentage of their total sport sales sport footwear, sport apparel and sport equipment sales made up. The survey shows that there is no uniform stock mix for sports retailers. While sports equipment is a major product category for about a quarter of the respondents — more than half their sales — others say it contributes less than 10% to sales. Footwear is, however, an anchor category for most respondents: 62% say that footwear sales comprise 25-75% of their sales (31% say 25-50% and 31% say 50-75%). Independent sports retailers tend to sell less sports apparel than chains — 22% independents report that apparel forms more than half their sales, while 27% of all the respondents (chains included) say more than half their sales are in apparel. But, more than a third report that apparel contributes less than 10% to their sales, and three-quarters of the sports retail respondents said that apparel comprises less than half of their sales. What sporting code sells best? But what sporting codes sell best for the retailers who responded? In a country that has big soccer support, it is not surprising to see that soccer is by far the best selling code. More than half of the respondents indicated it sells the best for them. Soccer is the best seller in retailers with all kinds of product mixes — whether they sell more than 75% sports equipment, footwear or apparel. For 39% of the respondents cricket is their best seller and 30% say rugby is the sport that sells best for them. This is not surprising due to the amount of support both these sports enjoy in SA. With more equipment to sell and higher price points, one would also expect cricket to contribute more to sales than rugby. Most of the respondents who indicated that sports equipment contributes more than 75% of their sales, say cricket equipment sells best, with hockey their other best-selling seasonal sport. The respondents who sell more footwear and apparel (more than half their sales) on the other hand indicated that rugby is one of their top selling codes. Soccer, cricket and rugby are also all regular school sports, which would have an impact on the number of people buying footwear, apparel and equipment for each sport. 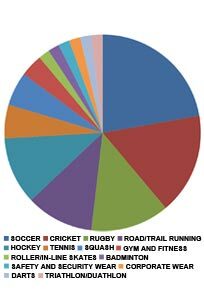 Hockey and road/trail running are the next most popular sporting codes, with 26% of respondents indicating that they are the best sellers. As a seasonal alternative to cricket, hockey does especially well for the retailers who mainly sell equipment (more than 75% of sales). Although there are fewer hockey players than cricket or rugby participants, hockey equipment is bought by both genders, contributing to the relatively high demand. The running contribution to sales corresponds with what we’re being told in the industry. Whenever we mention running to industry members, we’re told how much both trail and road running participation keep growing. Two thirds of respondents who indicated that sport footwear makes up more than 75% of their sport sales also indicated that running is a best-selling code. Also, half of the respondents who indicated that sport apparel makes up more than 75% of their sport sales indicated that running is a best-selling code for them. Racket sports — squash and tennis — are categories that are top sellers for 13% of the respondents, while 9% say that gym and fitness is a best-selling product category. Badminton, corporate gifts, roller skates, darts, etc. are good sellers for less than 5% of the sports retailer respondents. None of them indicated that sport leisure or fashion wear sell well for them. How big are balls in sport sales? We asked retailers to tell us what percentage of their total sport equipment sales inflatable balls account for. You could be excused for thinking inflatable balls might be a big percentage… especially considering how well codes such as soccer and rugby, that have inflatable balls, sell for respondents. According to respondents, however, inflatable balls are not worth getting excited over, with only 4.2% of respondents indicating that inflatable balls make up more than 75% of their total sport equipment sales. In fact, 67% of respondents indicated that inflatable balls account for 10% or less of all their sport equipment sales. Of those respondents who indicated rugby as a best-selling sporting code for their store, 86% indicated that inflatable balls make up 0-10% of their sport equipment sales.